There is no better way to honor you, our nation’s veterans, than to provide support for your successful transition by creating a pathway into a rewarding energy sector career. The nation’s electric and gas industries believe that veterans have spent their military careers protecting national security and are, among many things, battle-tested, self-motivated, and safety–conscious–traits that translate well into a second career into the utility industry. By hiring veterans into the industry, we are ensuring the continued production and delivery of safe, reliable power to American homes and businesses, and that servicemen and women are continuing to protect national security as they work to deliver a product that fuels our lives and powers our economy. Troops to Energy Jobs provides veterans with a roadmap for entry into highly skilled utility and engineering occupations within the energy industry. These jobs are both challenging and rewarding, and provide competitive compensation and professional growth opportunities. The Troops to Energy Jobs website is here to guide you on your path to a fulfilling energy career. Follow this ROADMAP step by step–take the time to explore the tools and resources available to you, and get any needed education and training along the way–and soon you’ll find yourself at your goal. Please note: It’s important to start the process EARLY. The following steps will apply whether you are in or out of the military. However, exploring these options early may give you a competitive advantage to an energy career even before you make the official transition. Energy jobs offer promising opportunities, whether you are an experienced worker or just starting your career. These jobs are active, hands-on, rewarding, and available in every state, in an industry that is stable and growing. In some cases, Troops to Energy Jobs will help you start working immediately in an energy industry-related job. Many companies hire professionals directly from the military for certain positions, which we call “Ready Now,” because these veterans only require company training as they transition to energy industry jobs. For others, some type of postsecondary education may be needed–in most cases, leading to a credential or degree. The Navy, Marine Corps, Army, and Coast Guard have moved to merge their transcript system into one standard academic transcript model that allows veterans to have one officially recognized military transcript. Making a decision to go to school is an important one, so finding the school that has the right training program for the energy industry and supports veterans like you through completion of education goals is critical. 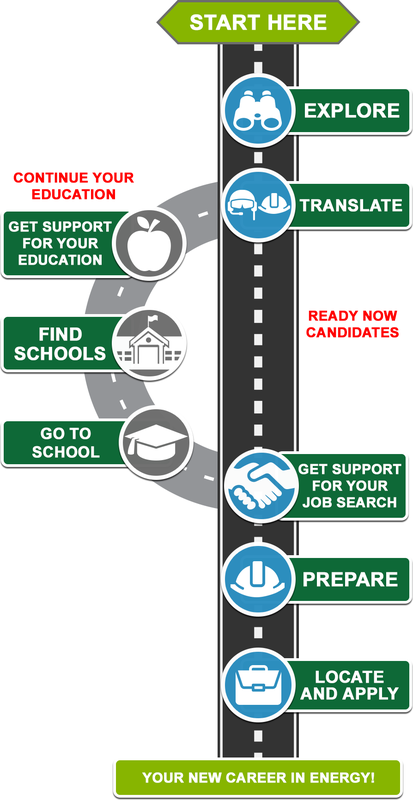 Now that you are in school to get on the pathway to a good energy job, it is important to understand the resources, services, and programs that your school may offer to service members and veterans to ensure you gain the needed support while in school and to help with career opportunities. Visit your Local Veterans’ Employment Representative (LVER) or Disabled Veteran Outreach Program (DVOP) Representative at a Career One-Stop Center for job search tools and assistance. Reach out to the Troops to Energy Jobs virtual career coach for guidance. Register and connect with employers by using the Troops to Energy Jobs Veterans Database. You can also find job openings in the energy industry with our Troops to Energy Jobs Job Posting Site.